Pregnantly Plump: Guess who dressed him? Since this was a holiday weekend, Little Elvis went to the cabin with Coachpa. It was kind of last minute, and I called Bob to ask him to pack an overnight bag. The weather's been confusing me, and I had put up most of his shorts and t-shirts, though some were still on the floor of his closet (waiting to be put up.) I told Bob to get some of those. He picked out Little Elvis' Sunday shorts (yes, I designate his clothes, at least in my mind they are designated) which are bright blue with little green frogs on them. He picked out a Toy Story 3 army men camo and orange t-shirt to go with them. My dad, who really can't match either, couldn't put Little Elvis in that mess, and left him in the long sleeve shirt he'd been wearing the day before. And he wore his Sunday shoes with the whole ensemble. Bob was in the midst of doing something else when I called, and I'm fairly certain he just grabbed and stuffed. My parents said that Bob wasn't nearly as bad as me, though. 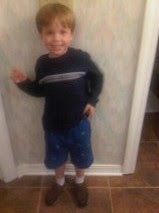 Apparently, I let my 4-year-old go to school on Friday morning with his pants on backwards. I'm the only one who makes him dress himself, and he knows which way is right. Usually I catch it when he puts them on backwards, but it wasn't obvious on Friday, and we were in a hurry. I don't think either of us scarred him with our clothes calls.